Samsung is betting big on a redesigned new line of flagship smartphones, but it's also not giving up on Android tablets while expanding a somewhat confusing wearable product portfolio and removing some of the confusion by dropping the Gear moniker. Basically, the company is pulling out all the stops and leaving no stone unturned in an attempt to halt an unfortunate trend of declining profits. As other tech giants remain completely uninterested in tackling the low-margin activity tracker market (we're looking at you, Apple), Samsung seems keen on broadening the appeal of a wearable device lineup that previously started at a rather prohibitive $200 price point with the Gear Fit 2 Pro. Enter the Galaxy Fit, which essentially aims to beat budget-friendly Fitbit, Garmin, and Xiaomi fitness bands at their own game. Can you guess what company topped the Q3 2018 global chart in wearable device shipments? No, it wasn't Apple. It was actually Xiaomi. Fitbit also came in third place, narrowly behind Apple but ahead of Huawei and... Samsung. Although Fitbit has recently found success in the smartwatch category as well, its biggest sellers remain cheaper products like the Charge 3, Alta, and Ace. Meanwhile, those ultra-low-cost Xiaomi Mi Bands are crazy popular in China, but there's no reason why something similar couldn't achieve that kind of popularity in the Western Hemisphere as well. When we say similar, we're obviously not accusing Samsung of ripping anyone off with the concept behind the Galaxy Fit. This is pretty much as old as time and it involves a small screen, a lightweight body (just 24 grams with the strap included! ), a dirt-cheap rubber band, a set of essential features for fitness enthusiasts, and stellar battery life. Samsung's newest entry-level wearable ticks all those boxes, but it may also be able to turn a few heads with some very attractive paint jobs. We're talking silver and black (pretty boring, huh? ), as well as the same eye-catching Canary Yellow color of the Galaxy S10e. The Galaxy Fit might not resemble the Gear Fit 2 Pro all that much on the outside, but on the inside, the differences are not as drastic as you think. Naturally, a modest processor is employed to track your workouts and show notifications from compatible Android handsets and iPhones on a small but high-quality 0.95-inch full color AMOLED display with 240 x 120 pixel resolution. While you can manually select from over 90 different activities in your phone's Samsung Health app, the Galaxy Fit can also conveniently detect and start tracking a few popular types of workouts automatically, including running, rowing, biking, and just good old fashioned power walking. Like the Gear Fit 2 Pro, this neatly rebranded product is water-resistant up to 5 meters deep, also meeting MIL-STD 810G standards for top-notch durability. Now, the 120 mAh battery may sound tiny, but you can safely expect to get several days of usage out of that before having to recharge this thing. Maybe even a whole week. 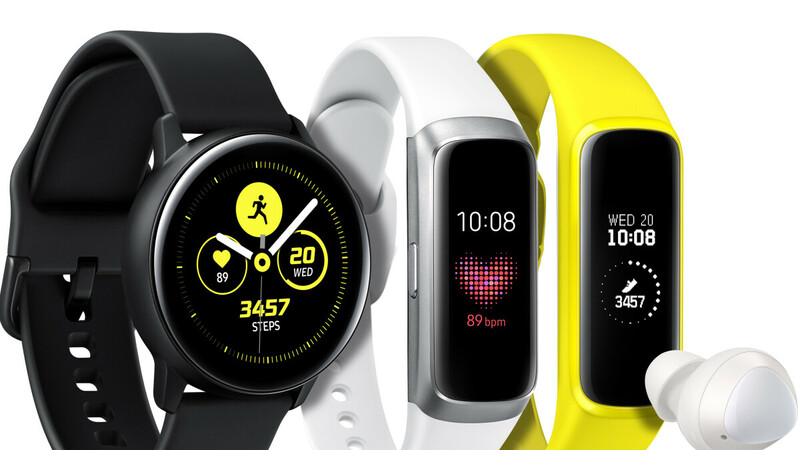 Perhaps the most impressive thing about the Samsung Galaxy Fit is that it still comes with a heart rate monitor, something that is standard in higher price brackets than what we expect this wearable to cost. Samsung is also highlighting stuff like "enhanced sleep analysis" and "smart stress management" as features that could set the Galaxy Fit apart from affordable wearable rivals. On the software side of things, the UX is described as "simple and intuitive", with alarms, weather information, and calendar events synced to your wearable's widget directly from your phone without you having to ever reach for your pocket. Let's be honest, the main draw of the Fitbit Alta or Xiaomi Mi Band 3 is the affordability factor. Unfortunately, we don't know exactly how cheap the Samsung Galaxy Fit is going to be. It's also unclear what happened to the recently leaked Galaxy Fit e, which isn't mentioned by name in Samsung's official press release today, but whose presence lingers on parts of the promotional text talking up "thin, lightweight bodies" and the water resistance of "both devices." For the time being, all we know is the Galaxy Fit is coming in Q2 2019 at a price rumored to circle the $100 magic number.